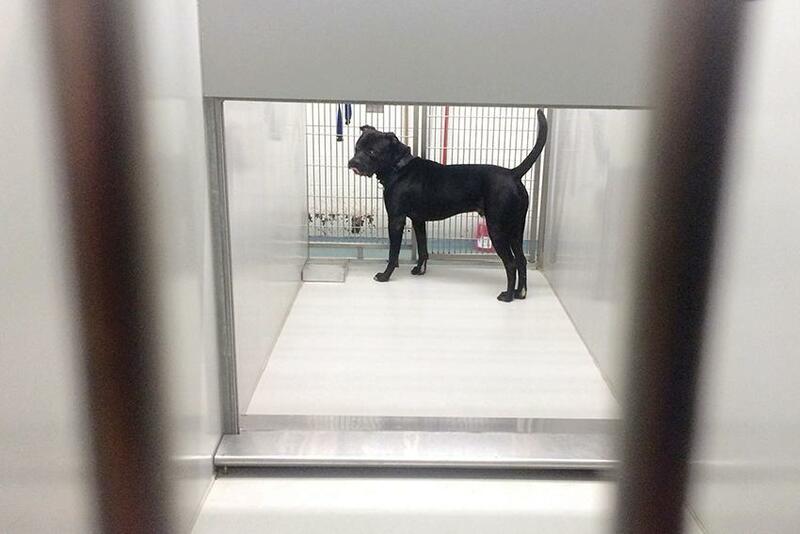 A dog stands in his kennel at Evanston Animal Shelter, 2310 Oakton St. Aldermen approved Monday an amended animal welfare policy updating the shelter’s protocol for euthanizing animals based on behavioral problems. Evanston officials approved more detailed animal shelter euthanasia guidelines Monday as part of an update to the city’s animal welfare policy. Aldermen voted unanimously to approve the amended guidelines, which require consideration of each euthanasia by the city’s Animal Welfare Board, a veterinarian and, ultimately, the animal warden. The policy also requires Evanston Animal Shelter Association, the nonprofit that took over the shelter from the city in May, to maintain a 90 percent live-release rate or else come under scrutiny of officials from the American Society for the Prevention of Cruelty to Animals. Plans for a specified euthanasia protocol have been in the works since the shelter’s previous owner, Community Animal Rescue Effort, was ousted from the shelter in May 2014, said Vicky Pasenko, a former CARE volunteer who now helps oversee the shelter. Pasenko, who co-founded EASA and represents the organization on the Animal Welfare Board, said the guidelines outline a system of “checks and balances” meant to spread out decision-making power regarding euthanasia decisions. CARE severed ties with the city nearly a year and a half ago largely due to the organization’s canine euthanasia rate, which in 2012 was about 45 to 50 percent, a statistic disputed by CARE. Alisa Kaplan, EASA’s co-founder and a former CARE volunteer, told The Daily last month that since May, EASA has euthanized zero dogs and three cats due to medical reasons. In determining whether a dog should be euthanized, the shelter must follow ASPCA guidelines, provide written observations of the animal’s behavior in the kennel and videotape each assessment. In a case in which the animal warden disagrees with the Animal Welfare Board’s decision to euthanize, the shelter is required to send the animal to off-site training or evaluation before being reassessed by the warden. “Every effort will be made to pursue a live release if possible,” the policy states. Ald. Melissa Wynne (3rd) said while writing the guidelines the city considered widely-accepted euthanasia protocols used in shelters with low euthanasia rates. The standards CARE used when it ran the shelter led to unnecessary euthanasias, Wynne said. “I think this is going to be using a different standard — one that is more widely accepted,” Wynne told The Daily. Pasenko said if the live-release rate drops below 90 percent, the ASPCA will consider whether the rise in euthanasias can be attributed to an influx of dangerous dogs or the decision-making protocol needs to be altered. These safeguards were enacted to ensure future shelter managers adhere to ethical practices and prevent them from falling into the past practices of CARE, Pasenko said. Aldermen also approved Monday funding for two part-time employees to oversee shelter operations starting this week and another part-time employee to provide kennel assistance starting in January. The city will provide the shelter $65,000 each year to pay the employees until the end of May 2017, when EASA’s contract with the city expires.